Belgian Shepherd Dog Explained. Highly intelligent, Alert And Sensitive. The Belgium Shepherd Is The Perfect Companion Dog. The Belgian Sheepdog, known to their countrymen as the Groenendael are just one of the shepherd dogs working in fields in Belgium. Originally developed by Nicholas Rose who bred the dogs to herd and to protect. These dogs were all created in the same kennel, and soon became one of the most popular dogs to have, in fact most people will have chosen the dog for themselves even before the mother has given birth. 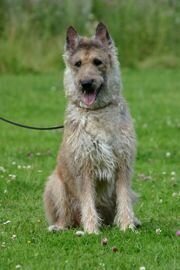 The belief is that these dogs came from German Shepherds, and are often called the Continental Shepherds. In some regions, these working dogs are considered four different varieties of a single breed. In other regions, they are considered to be completely separate breeds. The Belgian Shepherd dog is a natural protector of family and livestock, and considered to be one of the best original herding dogs. As well as being classified as a herding dog, this breed of dog is also used by rescue workers and by the police, known to be very athletic and intelligent. They look almost like the German Shepherd except for their chest and muzzle. The dog 's muzzle is long and tapered, their eyes are furthur apart and they have a look that says they are intelligent. Their body is extremely powerful and beautiful, with strong legs just made for running and playing games. Their coat is in a double layer, the inner coat they have is very soft and the outer coat is a red tint. The Belgian Shepherd dog is considered by some as the best protector and herder of livestock. They are smart, intelligent, very alert and capable of working out a problem without the help of their master. They are very loving and sensitive, and are noticeable upset when you show disapproval. 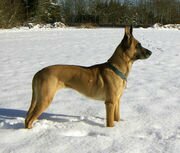 As with most working dogs, the owner of a Belgian Shepherd must maintain the dog's repect, and respect the dog in return. Belgian shepherds can over-react badly to "negative" training, so as a rule their training should be based on reward. It is important for the owner to know how to train dogs or to enroll in training classes to avoid misunderstandings. Professional training is highly recommended by trainers/academies specific to this type of dog, as well as continued training or development beyond the basics, such as obedience, agility and herding and other sports. Bored Belgians can become annoying, destructive, manipulative or territorial, all in an effort to engage with their family and environment. Negative behaviors usually result from insufficient stimulation. These behaviors can be prevented or alleviated with play, work, and exercise. Belgians are highly trainable dogs that thrive on intellectual stimulation. You will need to teach them social skills early on, or they may become shy or aggressive. Teaching them to be a good well adjusted animal is very important for this type of dog. This dog is easily trained to live in a house with other dogs. However, they show a tendency to chase cats, if you have cats you will want to get the Belgian Shepherd while it is a puppy and raise it with the cat, they will be more accepting if they get to know the cat as a family member. 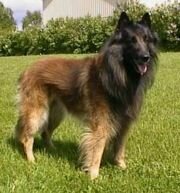 The Belgian Shepherd is usually a very hearty dog and less likely to get sick. They are still prone to a few diseases which are avoided if monitored and detected early. They may suffer from epilepsy which is a disease which causes the dog to have seizures, properly treated this is not a problem. They may also experience hip dysplasia and elbow dysplasia as well. The best way to avoid sicknesses and have a healthy dog is to follow a regiment of regular vaccinations and have the dog wormed once a year during vet visits. Another thing about the Belgian Shepherd is that every year it will experience heavy shedding at least twice. Because the dog has two coats, you will need to know how to care for both. The outer coat is thick and waterproof and the inner is soft and insulating. Always be sure to brush the outer coat and use a grooming comb with pins to brush the inner coat. Keeping your dog clean and well maintained will show him you love him and make for a healthier dog. All in all, the Belgian shepherd dog is an excellent choice as a companion and family pet. They will love, protect and respect the right owner 100%, and suit every member of the family. They do need to be trained but will excel at any task you give them. A fantastic choice of dog!